The Pickle is a high-performance portable pickleball machine that only weighs 35 pounds and runs off a 4-hour battery, giving players plenty of time to practice. The 8-inch wheels make it easy to roll to the court, even if it needs to go over curbs. A fast charger and 2-function remote control are optionally available, and the machine is covered by Lobster's 2-year warranty. The Pickle is made in the USA. The Pickle holds up to 135 indoor or outdoor pickleballs, more than enough for an intense practice session for one or more players. 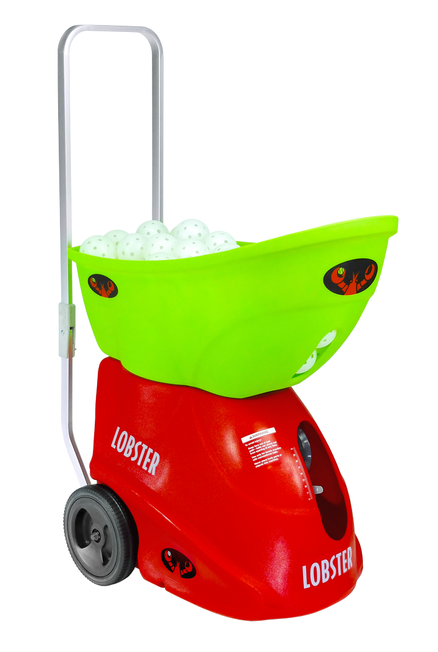 It throws balls at up to 60 mph, with several modes guaranteed to keep players moving. The Pickle can apply both heavy top and backspin, random oscillation, and high lobs. This versatility allows players to practice all kinds of Pickleball shots, like the dink, dive, lob, and groundstrokes. Players can work on any part of their game while receiving a fantastic workout. Tennis Court Supply is proud to offer The Pickle at a lower price than our competitors. We're also offering free shipping for a limited time only, so now is a good time to get at least one Pickle for your facility. We feel this is an industry-leading Pickleball machine and encourage you to provide a few for your players. With 4 hours of battery life and 135 pickleballs, players will feel they get more than enough for their rental fee. To add the fast charger or remote to your order, select them from the menu on The Pickle's page in our online catalog. An AC power connector is also available for stationary operations. Don't forget pickleballs and other Pickleball equipment, and of course, ball pickups to collect and carry mass amounts of pickleballs from all over your courts! Please feel free to contact Tennis Court Supply if you have any questions.